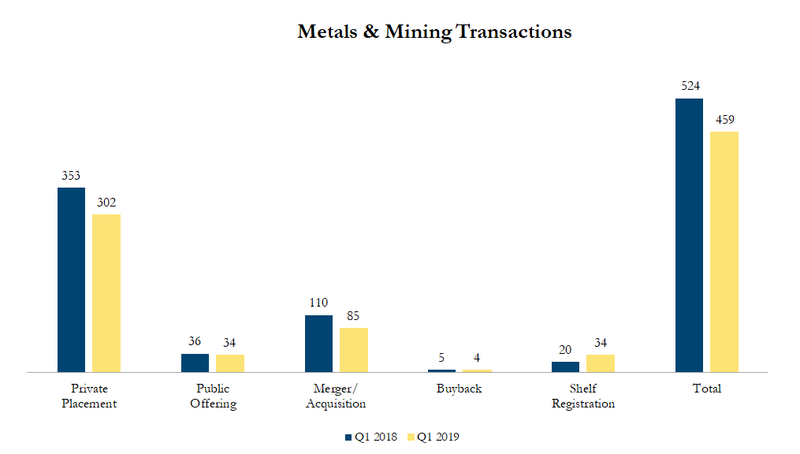 Q1 2019 Metals & Mining Transactions – Sinclair Range Inc.
On January 14, 2019, Newmont Mining Corp. entered into a definitive agreement to acquire Goldcorp Inc. for US$10 billion. Both companies have a variety of active mining operations around the world. For each Goldcorp share, a shareholder will receive 0.3280 of a Newmont share and $0.02 in cash. Post transaction, Newmont and Goldcorp shareholders will own approximately 65% and 35% of the combined entity, respectively. Upon closing of the arrangement, Newmont will repay Goldcorp’s $400 million term loan and $480 million drawn on Goldcorp’s $3 billion revolving credit facility. Newmont’s offer represents a 19% premium to Goldcorp’s undisturbed trading price and 1.02x consensus net asset value, which many analysts have deemed too low. On March 11, 2019, Barrick Gold Corp. terminated its $17.9 billion bid for Newmont Mining Corp, announced late last year. Barrick had originally proposed to buy Newmont in an all-share US$17.8 billion hostile deal that represented an 8% discount to the prior closing price. The two companies have since signed an implementation agreement to create the world’s single largest gold producer at the Nevada complex. The joint venture operations produced approximately 4.1 million ounces in 2018, more than three times the next largest gold operation. Calculations include asset purchases and sales, joint ventures and minority and majority shareholdings that disclosed a transaction value and were announced within the time frame. Cancelled transactions were excluded. Exchange rates based on historical figures.